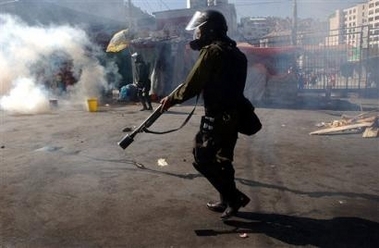 Riot police break up protests with tear gas in La Paz. Thousands streamed into the Bolivian capital, La Paz, on Tuesday as Indian protests against the ruling elite gained force even after President Carlos Mesa offered his resignation. 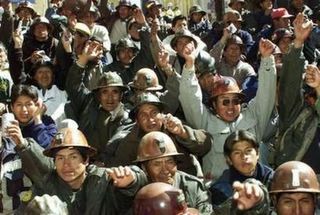 Demanding that the government expropriate foreign energy installations and call new elections, miners in hard hats and indigenous women in derby hats and colorful, multi-layer skirts marched into La Paz in a show of force punctuated by blasts of dynamite that demonstrated the depth of the crisis buffeting the government. The police fired at the protesters with tear gas, rubber bullets and water cannons, photographers at the scene said by phone from La Paz. Soldiers armed with rifles were, for the first time, patrolling the streets and guarding the seat of power in La Paz’s main square, Plaza Murillo. Bolivian women sit in an empty market as the continual protests in the capital have caused food and oil shortages. The Organization of American States (OAS), which groups 35 American nations including the United States and Canada, Tuesday passed a declaration on the situation in Bolivia at its General Assembly in Florida. But it may be too late for that as the situation has not calmed down since the president’s resignation late Monday. Bolivian miners bring something different to the growing protests- dynamite! One man lost his hand when he lit a stick during the protests in La Paz. Protesters are calling for the nationalization of all gas companies and demand a constitutional assembly to rewrite Bolivia’s laws to give indigenous people more representation in the government. They are also demanding greater autonomy for some of Bolivia’s wealthier gas-rich provinces in the east. Yielding to public pressure, President Mesa approved a controversial bill last month that drastically increased taxes on foreign-owned oil and gas companies, even though he had repeatedly spoken out against such a move. But protest leaders said the measure was insufficient, and demanded total nationalization of the industry. Last week, Mr. Mesa went further and announced that the constitution would be rewritten by a specially elected assembly. He said a referendum would be held on the autonomy request for the eastern provinces. 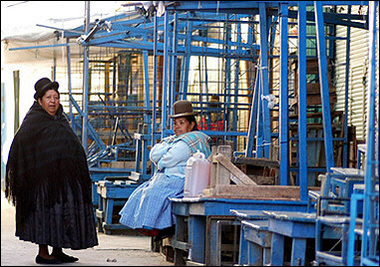 For many ordinary Bolivians, like Antonio Aguilar, Bolivia’s whole system is rotten. Mr. Auguilar says Bolivians are serving a few rich people because of the system. He says changes must be made in a society where few are rich and the majority is poor. A. M. Mora y Leon at Publius Pundit has much more on the situation. Here is a previous posting on the situation in Bolivia. Instapundit is following the explosive story now. And, there is a stunning article over at Ciao! by Miguel.